Comfortable bach one minute walk to the beach with no roads to cross. Two sunny decks for morning coffee and afternoon BBQ. Fenced section although older children could be able to open the gate. Small section for children to run around and throw a ball. 10 minute walk to cafes and takeaway shops and Four Square for grocery supplies. Fully equipped kitchen. Small garden shed and under house area to lock up surfboards and bikes. 20 Minutes to Karangahake Gorge for cycling and walking. Parking on the section and also outside the fenced area. Linen/towels provided. Also beach towels available. There is no extra charge for these. No cleaning charge but we do appreciate the bach being left clean and tidy. Cards, monopoly, snakes and ladders. 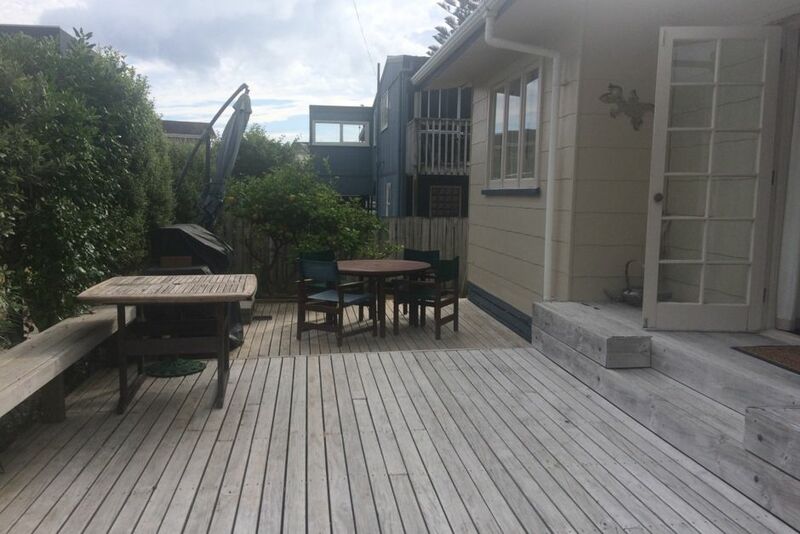 Great kiwiana bach in a perfect location at a beautiful beach. Loved our stay here - perfect for a relaxing break. Comfortable bach and being close to shops and a hop,step and jump from the beach gave us everything required. There are excellent walks around the area and obviously the beach is beautiful. Great stay - we shall return. Clean. Tidy. Everything you need for that weekend get away. We left some things behind and sue was kind enough to post. Thanks so much Sue and Pete. Your little Bach was super tidy, very cute and had everything we needed to have a nice couple of days away. My mum loved the surprise and we were so grateful that you were so flexible. Ka pai! Would have really liked to have stayed longer as a great location for the beach and town. Very comfortable accommodation too. Pleased you enjoyed your stay and thanks for leaving the place so tidy. I hope if you are back this way that you might stay again and for longer to enjoy the spot. We loved our stay at this bach. Very close to the beach. Had everything we needed. Would love to come back! Awesome spot, close to the beach and with everything you need. Highly recommemd. We really enjoyed our time at this very comfortable, authentic kiwi bach which had everything we needed. Great to be so close to the beach with no roads to cross. The owners (Sue & Pete) are very generous people who made sure we had everything we needed to make our stay enjoyable, which it was. Very happy to recommend this holiday home.